Ideal durable outdoor tool to display any message. 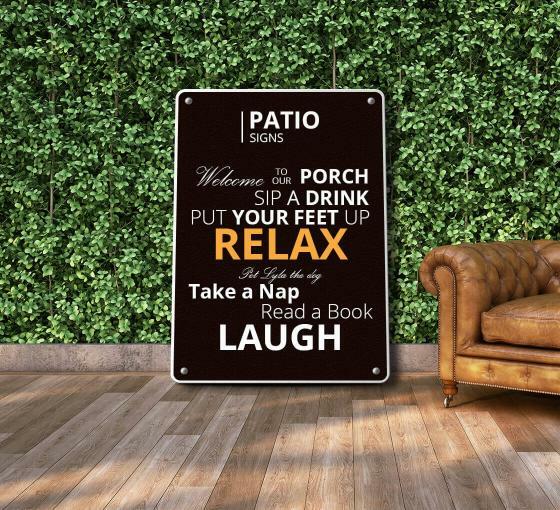 Whether you want patio signs for your home or office space, we offer it all. At BannerBuzz.com, we offer a massive collection of patio signs for you to choose from. But if you are in search of something unique, we offer unlimited customization options so that you get a perfect sign ready-to-be-installed in your patio. When it comes to customization, we offer our clients complete freedom over the design process. From the message on the sign to the size, we let you take complete control when designing your custom outdoor patio signs. And you have a special request, feel free to get in touch with our design experts. At BannerBuzz.com, we offer high quality, patio signs to ensure longevity and greater value for your money. Therefore, we manufacture outdoor signs from high quality materials that is rust-resistant. The UV protective coating on these signs is what keeps them intact for several years. So, whether you want to promote your brand or welcome your guests in a heart-warming manner, our patio signs are perfect for it all. With our design services, you can make your custom outdoor patio signs appear much more enticing and visually appealing.